The Ural mountains are a natural boundary between Russia’s European and Asian parts. It’s spring but the local climate allows skiing until early May, as we shall see in this issue of ‘Russian Life’. Russia’s biggest ski resort is spread over the slopes of one of the world’s oldest mountain ranges. Families from nearby industrial cities and tourists from all around the country come to Abzakovo for all kinds of outdoor recreation all year round. The great steppes at the foot of the Ural Mountains have seen a number of different cultures that have superceded one another over the course of centuries. Just a couple of hours away from the ski slopes, this open-air museum tells the local story. Arkaim shows history’s ancient dawn and recent past. This heritage site was discovered in 1987. The unusual settlement dates back to the 17th century BC. Its circular clay walls defended the thousands of inhabitants who lived in these beautifully designed dwellings. The precious foundations of the ancient city are now kept safe under the ground. A fragment of the defence wall has been rebuilt to demonstrate its elegant layout. This unique site was meant to be flooded for a water reservoir – it was saved at the very last moment by a big campaign to protect it. “We found ourselves at a key point in history in this steppe region, we discovered the key to the whole Indo-European formation, which became the basis for many later cultures – Ugric, Turkic, and so on,” said Gennady Zdanovich, the deputy director for science at Arkaim museum-reserve. “Of course, we couldn’t miss this opportunity to showcase the wonderful history of this steppe and its relations to world civilizations,” he added. Archeologists found marks of an advanced prehistoric people occupying this area from the third millennium BC. Local hunting tribes discovered how to domesticate horses and made the important shift from temporary shelters to permanent dwellings. Today at the vast museum site we find carefully restored dwellings of Stone Age men, built with the tools and techniques of the time. 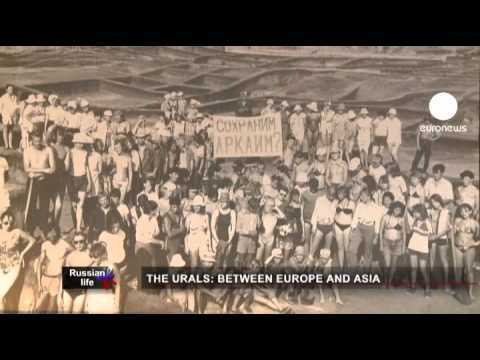 The word “Ural” is usually linked to “mountain” in ancient local dialects. The Arkaim settlement is said to be the most enigmatic archaeological site in Russia. Approx. between 1500 to 2500 people could have lived in Arkaim in the 17th century BC. Tens of thousands of tourists visit the site every year despite the very modest accommodation. Arkaim Archeologist, Aleksander Kislenko, said: “We recreated these dwellings using archeological data found on several dozen excavations around this region. “We have integrated many construction elements of the actual Stone Age buildings, which we managed to identify. The early iron-age burial mounds, also recreated in the Arkaim reserve, show how the tribes of the Ural steppes built full-scale houses for their deceased leaders, so they could lead their normal way of life in another realm. The voyage through the Urals’ past ends at the 19th century-style Cossacks estate where traditional Russian arts and crafts are kept alive by local folk culture devotees. “You know, without a past there’s no future. People who forget their past lose the links to their culture, especially in today’s urbanized world,” said Oksana Maltseva, from the Arkaim museum-reserve. In the next issue of ‘Russian Life’ we will go to Baikal. The world’s deepest lake is one of the most sacred places in Asia. The land of Buryatia and its spiritual traditions of Buddhism and shamanism. The Ural mountain’s (the eastern part is considered a natural boundary between Russia’s Europe and Asia) are not very high. But locals are proud to point out that this formation is one of the oldest surviving mountain ranges on Earth. The destination is also much more affordable for the average Russian family than the European Alps. When we arrived at Abzakovo, the largest ski resort in the area, was crowded with famillies celebrating the 1st of May. It is a holiday and officially called the Day of spring and labour, which was originally the Soviet International Workers Solidarity Day. Just an hour’s drive from the slopes is the industrial city of Magnitogorsk, home to one of the largest iron and steel works in Russia. The city has a scary anti-utopian skyline of rising smokestacks, some of them ending with flares of burning gas. The strong wind carry the industrial smog into the city, making children’s health the biggest concern for parents. Skiing, cycling or simply walking in the mountains are popular way to get some fresh air. Most of the people we met on May 1st preferred taking walks and enjoying the picturesque views of the Urals. One or two ski slopes were still open – the layers of wet snow are pretty thick, so those interested in skiing or snowboarding can continue to have fun. The main hotel, which was built in the Soviet times, has kept most things intact. There are some new attractive places to stay for those who can afford to spend more. Another main attraction of the southern Urals, especially for fans of archaeology and past cultures, is the ancient settlement of Arkaim and the large historical park that surrounds it. The site, which is a couple of hours from Magnitogorsk, was discovered at the end of the 1980’s. The area was going to become a new water reservoir but after a routine archeological examination that changed. A team of young scientists, led by Gennady Zdanovich, found traces of circular walls dating back to the 17th and 20th century BC. The large wooden and clay castles were protected by high-rising multi-level walls and elaborate labyrinth passages at each of its four entrances. The discovery made headlines all over the world, fuelling a massive campaign to protect the area from flooding, which was successful. Linked to Proto-Indo-European Arian culture, Arkaim quickly became a place of pilgrimage for all kinds of New Age followers. The area was promoted as a mystical site, making it Russia’s answer to England’s Stonehenge. Today the Arkaim settlement is mostly buried underground for protection. It plays a more scientific role as the center of a huge open-air museum. It features an exhibition building and several visiting sites. Starting from Stone Age dwellings built with real stone tools according to actual designs of pre-historic buildings found in the area and up to the modern traditional Cossack culture of the 19th century. The southern Urals needs to be improved so that it can be a touristic destination equal to other foreign historical sites. This region is gifted by its nature and heritage but needs better travel infrastructure to attract more visitors.